As Christians, we pray for God's kingdom to come "on earth as it in heaven." But what does that even mean? Would we recognize God's kingdom if it moved in next door? Learn to see God's work in your neighborhood, city, and the world--and learn how to join it. With stories from his own city of Houston, Texas, author Marty Troyer introduces a theology of place that empowers us to truly see the work of God where we live, work, and play. 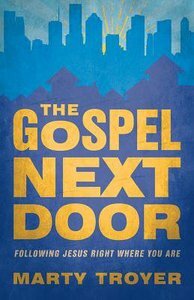 The Gospel Next Door unpacks the gospel through the lenses of following Jesus, making peace, and overcoming injustice. Those seeking to connect more deeply with the world that God so loved will find compelling stories and practical ideas for healing brokenness and imagining new life. Start living out the kingdom of God here and now. About "The Gospel Next Door"
Marty Troyer is a husband and father and a pastor and writer in Houston, Texas, where he's served at Houston Mennonite Church since 2008. He loves preaching and working to make God's kingdom come "on earth as it is in heaven." His blog, The Peace Pastor, which emphasizes a gospel-centered Jesus ethic, has been hosted by the Houston Chronicle for more than two years. Troyer's blog has led him to countless encounters across the city and nation about what it means to take Jesus' call to peace seriously.